The citations included "brakes out of service" and "brake connections with constrictions under vehicle," the records show. "As we understand right now, the inspections last month were minor things - windshield wipers, a latch on a window that needed to be fixed - and all those things were fixed," lawyer Lee Kindlon, who represents Prestige Limousines, said on "Good Morning America" on Tuesday. "In fact, they said that one time he was driving one of the vehicle's and a muffler fell off with clients in the car and he had to stop the car, get out of the car, remove the muffler and move it to the side of the roadway," he said. 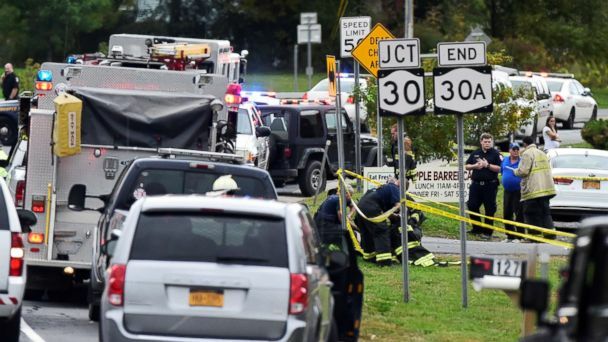 The operator of the limo company, Nauman Hussain, was arrested on Wednesday in a "controlled traffic stop" because state police feared he was trying to flee, a source told ABC News. The district attorney said there were suitcases in the car, though Hussain's defense attorney said he feared death threats. Investigators aren't sure whether to believe that.